A man wields a bat in front of the Hall of Justice in downtown Los Angeles on Tuesday, Oct. 25, 2016. 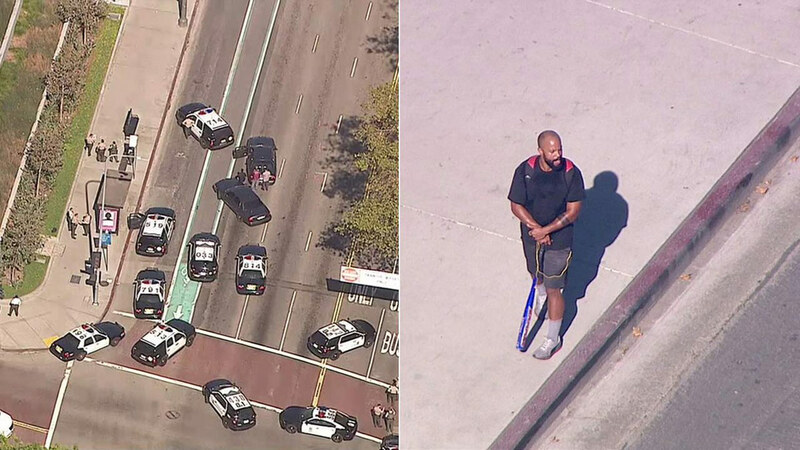 DOWNTOWN LOS ANGELES (KABC) -- A man wielding a bat blocked the front steps of the Hall of Justice during a standoff with authorities in downtown Los Angeles on Tuesday. The man paced back-and-forth in front of the steps at the Hall of Justice as deputies with the Los Angeles County Sheriff's Department tried to speak with him. "No justice, no peace," the man was heard yelling. After an hours-long standoff, the man surrendered peacefully and was taken into custody. The sheriff's department said the man was wanted for vandalism at the Vermont Green Line Metro Station. According to deputies, the suspect damaged a display case. Spring Street was closed between Temple and Aliso streets as law enforcement officials attempted to talk the suspect into standing down.